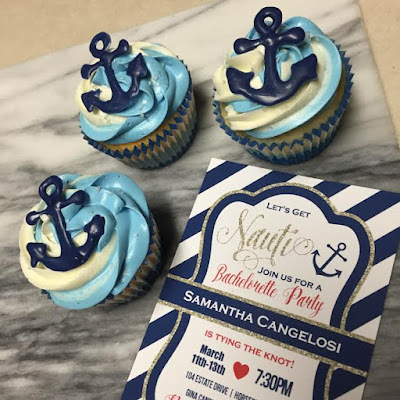 Back in March my friend had an amazing nautical bachelorette party. 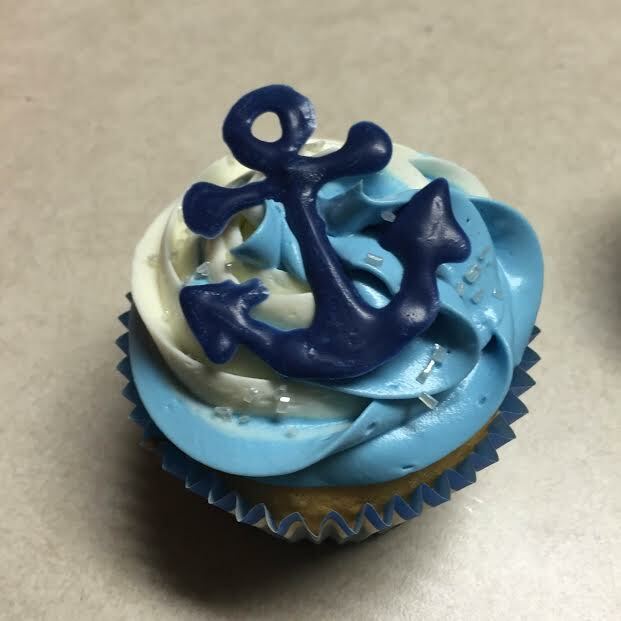 Tasked with bringing dessert I searched for the perfect themed cupcake. These beauties may look difficult but are really super easy to make. 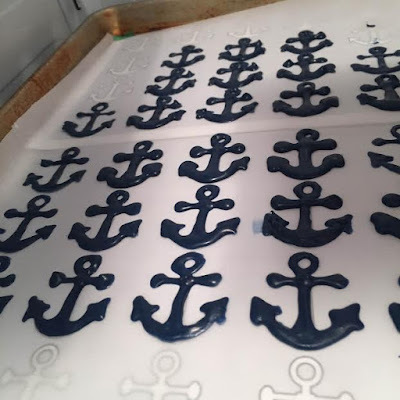 Start by printing out the anchors to use as a pattern. Place pattern on a tray and cover with wax paper. I googled "anchor outlines" and searched until I found one I liked. Melt candy melts as directed on the package. Pour melted candies into a Wilton plastic squeeze bottle and follow the patten. Place tray into the fridge to harden. Make white cupcakes of choice. Dye half of your icing blue using blue coloring gel. I wish I would have made mine a little darker so be generous with the color. Place blue icing in a small icing bag and the remaining white icing in the other small icing bag. 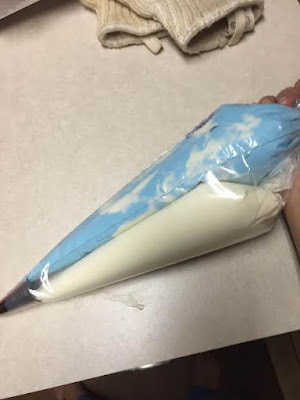 Take both bags and place them in the large icing bag with tip. 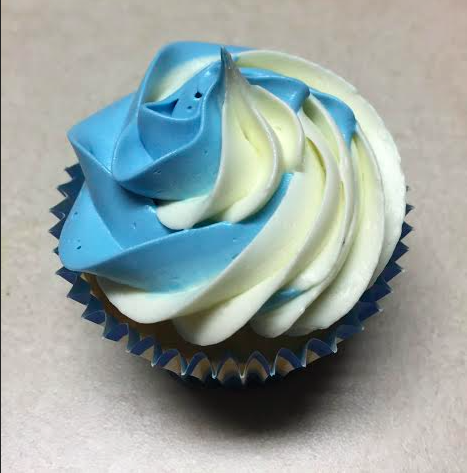 Ice cupcakes as normal. Both colors will come out and swirl naturally. I love that it looks like a little cloud. Take anchors out of the fridge and peel them off the wax paper. Place on top of cupcakes and sprinkle with crystals. Ta Da! 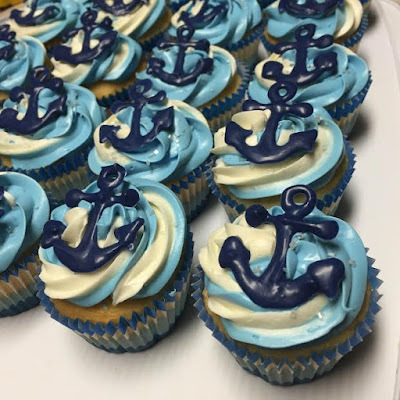 Perfect little nautical cupcakes that matched the theme. We had a blast and munched on these all weekend.